What's Poppin' Tonight! 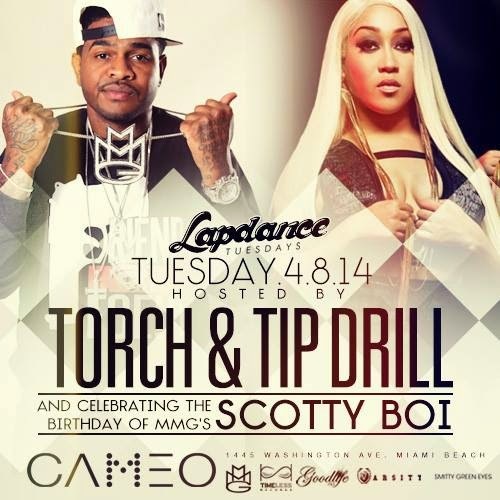 Lapdance Tuesdays Hosted by Torch & Tip Drill + More at Cameo Nightclub ~ Phresh Hott New! Join us for Lapdance Tuesdays as we present Torch & Tip Drill at Cameo Nightclub. Also celebrating the Birthday of MMG's Scotty Boi with sounds by DJs E-Feezy and Bulletproof. Text the word "LAPDANCE" to the number 38714 for Complimentary Champagne from 11PM - 12:30AM.